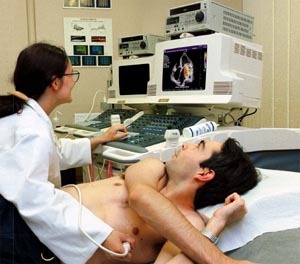 A Doppler ultrasound test uses reflected sound waves to evaluate blood as it flows through a blood vessel. It helps doctors evaluate blood flow through the major arteries and veins of the arms, legs, and neck. It can show blocked or reduced blood flow through narrowing in the major arteries of the neck that could cause a stroke. It also can reveal blood clots in leg veins (deep vein thrombosis, or DVT) that could break loose and block blood flow to the lungs (pulmonary embolism). During Doppler ultrasound, a handheld instrument (transducer) is passed lightly over the skin above a blood vessel. The transducer sends and receives sound waves that are amplified through a microphone. The sound waves bounce off solid objects, including blood cells. The movement of blood cells causes a change in pitch of the reflected sound waves (called the Doppler effect). If there is no blood flow, the pitch does not change. Information from the reflected sound waves can be processed by a computer to provide graphs or pictures that represent the flow of blood through the blood vessels. These graphs or pictures can be saved for future review or evaluation. 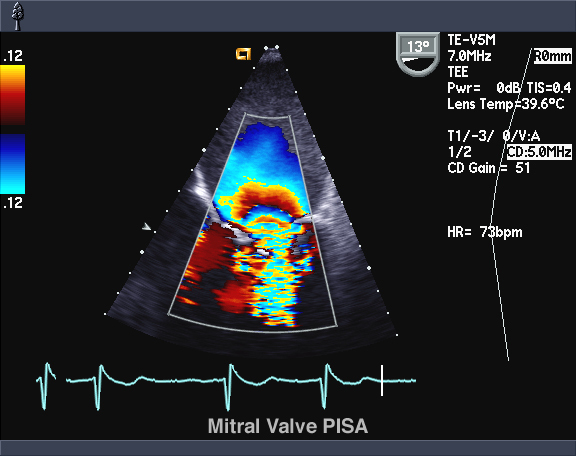 See an illustration of a Doppler ultrasound. This type uses the change in pitch of the sound waves to provide information about blood flow through a blood vessel. The doctor listens to the sounds produced by the transducer to evaluate the blood flow through an area that may be blocked or narrowed. This type of ultrasound can be done at the bedside in the hospital to provide a rapid estimate of the extent of blood vessel damage or disease. 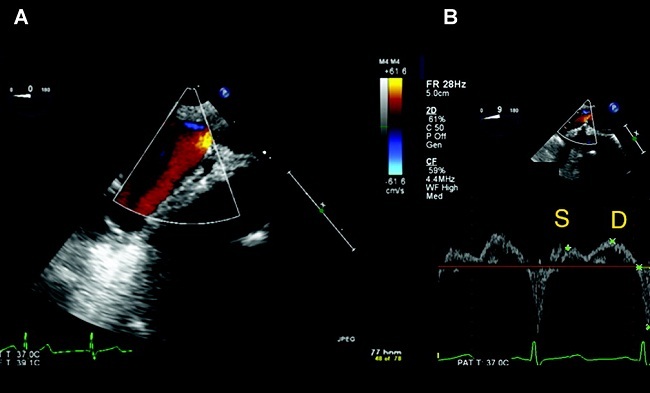 Duplex Doppler ultrasound uses standard ultrasound methods to produce a picture of a blood vessel and surrounding organs. In addition, a computer converts the Doppler sounds into a graph that provides information about the speed and direction of blood flow through the blood vessel being evaluated. DHTML Web Menu by OpenCube. Color Doppler uses standard ultrasound methods to produce a picture of a blood vessel. In addition, a computer converts the Doppler sounds into colors that are overlaid on the image of the blood vessel and that represent the speed and direction of blood flow through the vessel. Power Doppler is a newer ultrasound technique that is up to five times more sensitive in detecting blood flow than color Doppler. Power Doppler can obtain some images that are difficult or impossible to obtain using standard color Doppler. However, power Doppler is most commonly used to evaluate blood flow through vessels within solid organs. Blood flow in individual blood vessels is most commonly evaluated by combining color Doppler with duplex Doppler. Together, they are able to provide better information on the direction and speed of blood flow than when these techniques are used individually.